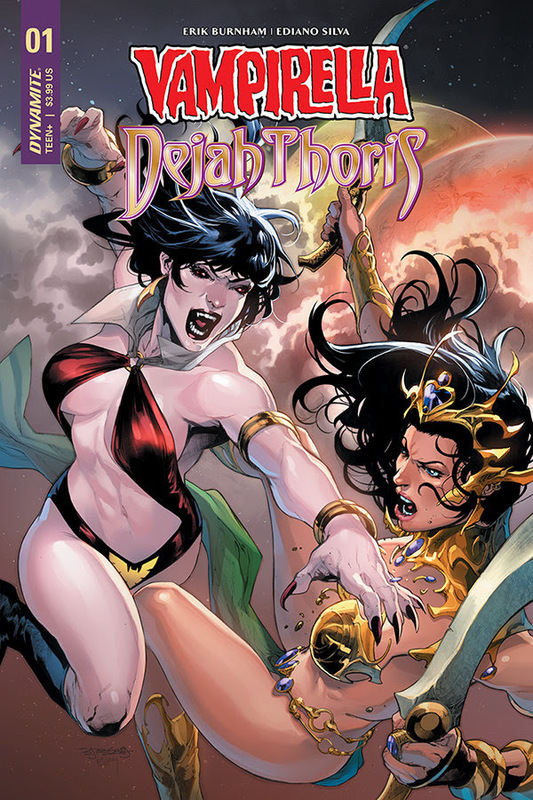 Vampirella Encounters Dejah Thoris in New Dynamite Series! Dynamite Entertainment is set to deliver the latest in epic crossover events with Vampirella/Dejah Thoris! The pulp tale that was destined to happen was created by Erik Burnham (Ghostbusters, KISS: The Demon) and Ediano Silva (Pathfinder: Runescars, Killer Instinct) is headed to stands this September! “Not a lot of folks know this, but some of my earliest work in comics was an unpublished adaptation of A Princess of Mars… I discovered Barsoom and Dejah Thoris then, and I’m ecstatic to not only play in that sandbox again but also introduce the princess to Vampirella!” says writer Erik Burnham. “This book is gonna be full of pulp fun — dead cities, vampires, carnivorous apes, and a pending alien invasion… all beautifully rendered by Ediano Silva,” added Burnham. Edgar Rice Burroughs’ classic character, Dejah Thoris, the Princess of Mars, debuted in 1912, and ever since, science fiction and fantasy enthusiasts have dreamed of the faraway Red Planet and all of its wondrous sights and monstrous perils. A strong and talented royal, Dejah served as inspiration for such heroines such as Princess Leia of Star Wars and Neytiri of James Cameron’s Avatar. Since her comic book debut in 2010, she has constantly served as an adventurous mainstay at Dynamite. The debut issue of Vampirella/Dejah Thoris features a wide selection of cover variants, providing fans and retailers with the freedom of choice! The cover artwork features the talents of Jan Anacleto (Dejah Thoris and The Green Men of Mars), Carlo Pagulayan (Deathstroke), Stephen Segovia (Dark Wolverine), Joe Jusko (Warlord of Mars) and two cosplay photo covers, respectively. Vampirella/Dejah Thoris #1 will be solicited in Diamond Comic Distributors’ July 2018 Previews catalog, the premier source of merchandise for the comic book specialty market, and slated for release in September 2018. Comic book fans are encouraged to reserve copies of Vampirella/Dejah Thoris #1 with their local comic book retailers. Vampirella/Dejah Thoris #1 will also be available for individual customer purchase through digital platforms courtesy of Comixology, Kindle, iBooks, Google Play, Dynamite Digital, iVerse, Madefire, and Dark Horse Digital. Founded in 1923, Edgar Rice Burroughs, Inc. administers the copyrights and trademarks associated with the works of American author Edgar Rice Burroughs (1875-1950), creator of Tarzan of the Apes, John Carter of Mars, and many other literary heroes. Headquartered in Tarzana, California, on the site of Burroughs’ former ranch, the company is owned by Burroughs’ heirs and continues to license adaptations of the author’s work in film, television, stage, print, and other media.